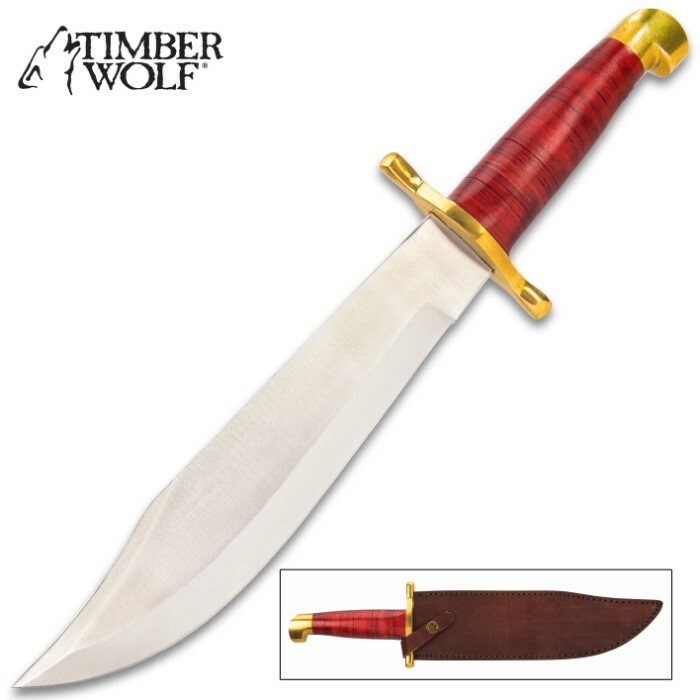 Timber Wolf Savage Rose Bowie Knife with Sheath | BUDK.com - Knives & Swords At The Lowest Prices! In the words of "Crocodile" Dundee, "Now THAT'S a knife!" There's no question - Timber Wolf's Savage Rose Bowie is big. Really big. The noticeably robust fixed blade knife packs serious muscle, but it's also surprisingly easy to handle, thanks to impeccable balance and thoughtful weight distribution. It boasts a stout 10" stainless steel clip point blade that's hefty enough to tackle even the toughest cutting jobs. 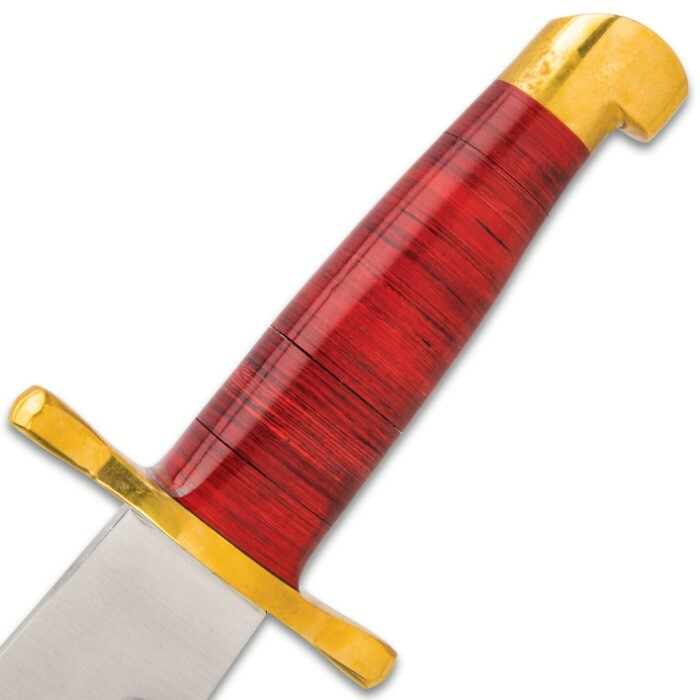 Polished to a high shine, the striking blade beautifully complements the gleaming brass guard and pommel. The handsome wooden handle features a delicate crimson stain that makes the wood's fine parallel grain pop with intensity. 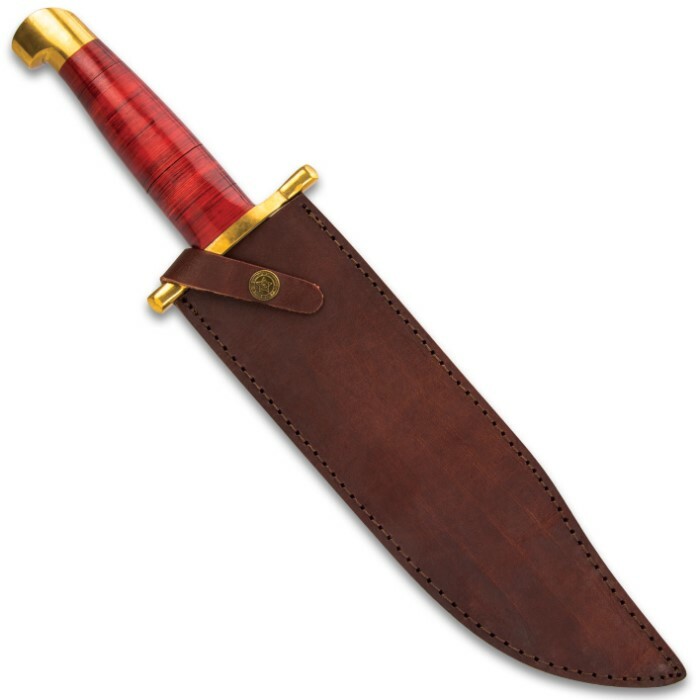 Housed in the included belt sheath, the Savage Rose Bowie is easy to transport, even through thick woods or over rugged terrain. It's equally well suited to display in a fine knife collection, and at this price, you may as well get two - one to use in the field and another to showcase in a collection or on its own! The knife is the quality I've come to expect from Timber Wolf and BudK. The sheath wasn't perfectly fitted but I could fix that fairly easily. All in all, I'm very happy!